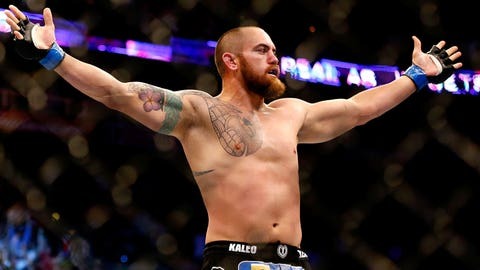 These days, Travis Browne is viewed as a gentleman outside the cage, polite and affable, but occasionally he will remind you that in his youth, he was known for a quick temper. It’s rare to see that emotional side publicly displayed. To him, the sport of a mixed martial arts is a noble game. Fighters meet face-to-face. There is no pretense in the arena of combat. It’s pure. That’s why until now, the unbeaten Browne has had no issues with opponents during his UFC run. It’s been handshakes and smiles both before and after fight night. To him, mutual respect is a given. Browne has gone so far as to welcome recent opponent Alistair Overeem into his gym with the belief that they could help each other improve. For the first time, though, he is involved in something of a mini-feud. It’s nothing close to a grudge match, but it’s clear that the issue makes him steamed. Back in the early stages of his career, he trained with current No. 2 contender Fabricio Werdum, and in the leadup to their UFC on FOX fight this Saturday, Werdum has spoken quite a bit about it, insinuating that he dominated Browne. To Browne, that kind of disclosure is highly inappropriate. First, it’s a betrayal of the cardinal rule that what happens in the training room is not for public consumption. Secondly, Werdum’s recollection is inaccurate. "Yeah, it ticked me off a little because I pride myself on being an honest person," he told FOX Sports. "He made it seem like he sent me home crying or something. It was nothing of the sort. Not one bit at all, whatsoever. So I don’t understand where he’s going with it. If you’re going to say stuff to the media just to get a little bit of attention, I don’t understand that kind of person." So what did happen in those early training sessions? Browne says at the time he first trained with Werdum, he was just months into his pro career. They did a couple of sparring rounds at the Affliction warehouse. A short time later, they met up at the Reign Training Center and worked out a few times, both sparring and ground work. "At the time I was happy to get in there and mix it up," he said. "I used those opportunities to see where I was at as far as sparring, the groundwork and stuff. For me, it was a great way to judge where I was because at the time Werdum was fighting in Strikeforce, and I remember thinking, ‘Oh, I can hang with that guy. I do well against him.’ I was excited." That’s far from Werdum’s recollection, of course. When asked if Werdum ever submitted him in training, Browne says no. "That’s why I don’t understand why anything was said at all," he said. "And also, it was 4 1/2 years ago. If you look at me 4 1/2 years ago and look at me now, it’s two different people. In the fight world, I’m three times the fighter I was back then. It doesn’t make sense to me. If you’re fighting in 2014 but you’re living back in 2010, you’ve got some serious issues." He has indeed come a long way. When Browne began his fight career, he was a 26-year-old rookie who had almost zero martial arts experience. To predict he would rise into the top five within five years would have been laughable, a long shot bet. Yet his combination of athleticism, power and improvisational ability have helped him surge up the rankings and put him within a single win of challenging for the heavyweight championship. It’s a journey that has challenged him both physically and mentally. He candidly admits that he’s questioned himself at times, only reaching full confidence after surviving Overeem’s onslaught and knocking him out in the same round. Imbued with that faith, Browne destroyed Josh Barnett in just 60 seconds, capping off a perfect 3-0 year in 2013 that put him into the hunt. Now comes Werdum, who since the midpoint of 2012 has fought a total of one time, giving away a portion of his career to inactivity due to a stint on TUF: Brazil. Browne sees his busy schedule as one of the reasons for his growth and success, and wonders whether Werdum has kept pace. But even that is mostly meaningless to him. All he can think about is his own here and now, and the matchup he’s soon to walk into. Even if there is a past between them, it has no bearing past a few words that shouldn’t have been publicly uttered. "I guess when there’s a little bit of a history between two fighters it makes people want to watch more. I can understand that. It can be interesting. What has he done differently? What have I done differently. Where are we at in our careers? Why do we think we deserve to fight for the UFC championship? But at the end of the day, as far as him getting into my head, good luck. Saying stuff like that isn’t going to make me fight one way or another. It’s kind of comical to me. I don’t need that to motivate me. I learned in fighting Overeem and Barnett that I’m one of the best in the world. I just have to go out there and perform."